Attention All! It’s the Holiday season and we at Psychedelicized are prepared to give you a mix of seasonal rarities for your listening pleasure! Five mini shows brought to you by Captain Christy, Whitebread, Rob, Rusty, and Cosmic Colin, equaling 1.5 hours of holiday obscurities! Turn on, tune in, and drop out on this Trip with Santa special! 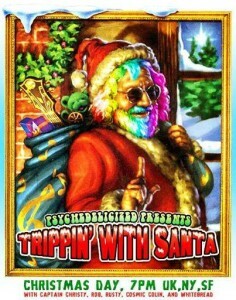 Seasons greetings and merry good times to all, from all at Psychedelicized!